Otitis externa in scuba divers: to treat prophylactically or not and if so what with? GS, a 34-year-old male, presented to his GP with a 3-day history of severe pain in his left ear and jaw. It was constant, made worse by eating and was affecting his sleep. The pain was accompanied by a “blocked” feeling and reduced hearing in that ear. He had recently returned from a diving holiday in Cornwall, where he had been unable to complete his PADI open water due to the ear pain and inability to equalise on descent. He had no previous history of ear problems and no other medical conditions of note but wanted to know when he would be better so that he could finish his PADI course. On examination, the left ear concha and auditory canal appeared erythematous. Inspection with an otoscope revealed an inflamed, erythematous auditory canal and tympanic membrane, which appeared intact. There was no visible otorrhea. Movement of the tragus and pinnae produced increased otalgia and there was a slight local, periauricular lymphadenitis. Ear problems are the most common medical complaint of divers1. Having worked as a PADI scuba diving instructor for over ten years I have seen how they can ruin a holiday for a client or with prolonged time out of the water, jeopardise the career of a diving professional. The majority of ear infections seen in divers are those of the external ear, namely, acute otitis externa. They are however, regularly misdiagnosed as otitis media and treated unnecessarily with oral antibiotics2. Otitis externa is the inflammation or infection of the external auditory canal and/or pinnae and is more commonly known as ‘Swimmer’s ear’. It can affect both ears and is often recurrent, particularly if a patient is run down or stressed3. One study found it to be disabling enough to cause 36% of patients to interrupt their daily activities for a median duration of four days, with 21% requiring bed rest4. It is a prevailing problem for divers yet can be avoided through patient education and the implementation of preventative strategies, especially for individuals with increased susceptibility; e.g. those regularly in the water or the immunocompromised5. The external ear comprises of the pinna and the external auditory canal. The external auditory canal is approximately 2.5 to 3cm long and lined with stratified squamous epithelium. The outer one-third is surrounded by cartilage and inner two-thirds by bone1. The external ear is separated from the middle ear by the tympanic membrane. The function of the external ear is to transmit sound to the middle ear whilst protecting the more proximal structures from foreign bodies and any changes in environmental conditions. Cerumen (ear wax) is formed in the outer one-third of the canal by apocrine glands. It contains bacteriostatic fatty acids that help defend the ear against invasive pathogens6. It also acts as a hydrophobic lining, repelling water and thus acting as a protective coat for the epithelium, preventing the canal from getting wet and encouraging bacterial growth. The pH of the external auditory canal is also slightly acidic (between 6.5 and 6.8) which serves as another natural bacteriostatic, anti-fungal defence mechanism1 7. Otitis externa can arise through contact with polluted water but predominantly the aetiology is that of a commensal bacterial infection. The most common bacterial causes are Pseudomonas aeruginosa (50%) and Staphylococcus aureus (23%)6. Less common causes include gram-negative organisms (12.5%) and fungi such as Aspergillus and Candida (12.5%)8. Frequent immersions in water lead to the loss of cerumen and the drying of the external auditory canal and consequently pruritus. Pruritus in turn can lead to the probing of the external auditory canal, resulting in trauma and an entry site for infection8. Otitis externa can also be caused by trapped water in the auditory canal, especially if the patient is living in a humid climate. Swimmers, surfers and divers are particularly prone to this condition if they already have ‘Surfer’s ear’; a narrowing of the external auditory canal due to exostosis (bony overgrowth). Excess cerumen can create a similar narrowing and increase the risk of infection. If unilateral, it can also result in asymmetrical caloric stimuli and vertigo while diving1. Any ear trauma including from the use of cotton buds or hearing aids, increases the likelihood of infection9. Individuals with allergic or inflammative conditions, particularly ones that lead to cell breakdown, such as eczema, allergic rhinitis, or asthma, have a significantly higher risk of developing otitis externa10 11. It is thought debris from these dermatologic conditions may encourage infection5. 4. Alteration of the pH of the canal. A change of pH in the external auditory canal is very important for the pathogenesis of otitis externa12. As acidity is lost, the risk of infection increases. The infection may either be circumscribed or diffuse. Acute diffuse otitis externa is the most common form found in divers. It has a rapid onset, becoming painful very quickly, as described in the case above. Pain in and around affected ear, worsened when the pinna or tragus is touched or pulled gently. 1. Otitis media, 2. Herpes zoster oticus (Ramsay Hunt syndrome), 3. Eczema of the ear canal and pinna, 4. Contact dermatitis, 5. Furunculosis (localised). In severe cases, the infection may spread to the surrounding soft tissues, including the parotid gland. For patients with immunocompromisation, e.g. poorly controlled diabetes mellitus, the infection may spread to the mastoid bone causing an osteomyelitis. Infections via this route may involve the base of the skull, in which case cranial nerves VII (facial), IX (glossopharyngeal), X (vagus), XI (accessory), or XII (hypoglossal) may be affected8. When infection has spread in this way the condition is termed necrotising or malignant otitis externa and may be life threatening. 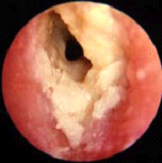 Tympanic membrane rupture is another possible but rare complication of otitis externa. If otorrhea, cerumen or inflammation makes full assessment of the tympanic membrane difficult, it is imperative that exudate is carefully aspirated via suction under direct vision and/or antibiotic-steroid ear drops prescribed in order to definitively exclude an underlying tympanic membrane defect such as a cholesteatoma or a perforation. During the Vasalva manoeuvre, used for equalisation, divers forcefully expand the tympanic membrane making them susceptible to perforations13 14. Getting the ear wet when the tympanic membrane is perforated (either via aquatic activities or flushing with water) is not advised as it can cause further infection and ossicular or cochlear-vestibular damage, resulting in hearing loss, tinnitus, vertigo and dizziness15. A full head and neck examination, including evaluation of the sinuses, nose, mastoids, temporomandibular joints, mouth, pharynx and neck should be performed in order to rule out alternative causes of disease and the presence of possible complications15. If very mild or in the early stages, otitis externa can be a self-limiting condition. If the infection is moderate to severe, or the climate is humid enough for the ear to remain moist, spontaneous improvement may not occur and medical treatment is required. The primary treatment of otitis externa involves simple analgesia such as paracetamol or NSAIDs e.g. ibuprofen, removal of debris from the external auditory canal and the use of topical ear drops containing acidifying and/or drying agents7. Topical antibiotics are used to control more persistent or severe infections8. Medication should be administered for three days beyond the cessation of symptoms (typically five to seven days)15. There is controversy over ototoxic medications such as gentamicin however, and potential problems with its use for over 7 days. Massage of the tragus following adminisration is imperative to ensure full penetration throughout the external ear canal. The placement of a wick inside the ear canal may be necessary in more severe cases, especially if the canal is narrowed due to inflammation7. Oral antibiotics (e.g. Augmentin) are generally reserved for use in patients with fevers, immunosuppression, diabetes, adenopathy, or in those individuals with extension of the infection outside of the ear canal8. *antibiotic ear drops that include a steroid. ** Floxin Otic (ofloxacin otic solution) is the only topical agent to be labelled by the U.S. Food and Drug Administration (FDA) for use when the tympanic membrane is perforated, thus oral antibiotics have traditionally been used in this situation despite the very small risk of cochlear damage. This is not the case in the UK where topical antibiotics can be prescribed despite the presence of perforations. It is now widely accepted that topical antibiotic-steroid combination therapy is superior to steroid-alone treatment for symptomatic control of otitis externa18. However, a recent Cochrane review and meta-analysis of 18 randomised controlled trials of topical antimicrobial therapy for acute otitis externa concluded that use of any topical antimicrobial significantly increased cure rate over placebo but there was no clinical or statistical difference in efficacy between different types of antimicrobial topical agents19 20 21. Patients with otitis externa should not dive1. During the course of the treatment the ear ought to be kept dry. Once the infection has cleared, usually within 4-5 days, aquatic activities may be resumed8. Figure. 6: American Academy of Otolaryngology: Flowchart for the management of acute otitis externa. Strategies to prevent acute otitis externa are aimed at limiting water accumulation and moisture retention in the external auditory canal and maintaining a healthy skin barrier. No randomised trials have compared the efficacy of different strategies however5. Avoiding inserting anything into the ear canal. The use of cotton buds or earplugs is the most common event leading to acute otitis externa. Avoiding washing the ears with soap, as this leaves an alkali residue that neutralises the protective acidic pH of the ear canal. After diving, gently rinsing the ear canals with sterilised water can help wash out any residual bacteria-infested seawater. Ensuring that the ear canals are emptied of water after swimming, bathing or rinsing. Drying the ears with a hair dryer is an effective measure. Using a specialist mask with protective earpieces (never ear plugs). Prophylactic ear drops after each episode of diving to assist in drying and acidifying the ear canal8. These contain a combination of vinegar (acetic acid) and alcohol (propylene glycol) in a 2:1 ratio. Well known brands include Swim Ear, Aqua Ear or Ear Magic. Due to its efficacy as a prophylactic for infection, Swim Ear was awarded the 1996/7 Award of Merit for Diving Innovation by the world’s largest internet resource for divers, ukdiving.co.uk22. There is however, an established trend in the diving community (particularly amongst UK-based divers) to use homemade recipes for the prevention and treatment of otitis externa as an alternative to these expensive products. Ingredients include alcohol, vinegar and olive oil in various proportions23. We would not recommend this practice unless fully assessed by a medical doctor before hand to ensure the tympanic membrane is fully intact. Otitis externa is a painful condition that is unpleasant at the best of times but particularly frustrating when it ruins a diving holiday. Once correctly diagnosed it can be treated easily with topical antibiotic-steroid ear drops and aquatic activities can resume after around one week. As with all diseases though, prevention is the key. 1. Edmunds, C, Lowry C, Pennefather J, Walker R. The ear and diving: anatomy and physiology. 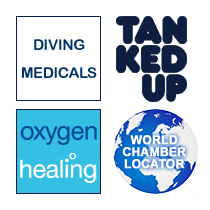 Diving and subaquatic medicine. Oxford: OUP; 2002. 3. Bowdler D, Faulconbridge R. Infections of the ear. http://www.entuk.org/patient_info/ear/infections_html. (accessed 27 Jan 2011). 4. van Asperen I, de Rover C, Schijven J, Oetomo S, Schellekens J, van Leeuwen N, et al. Risk of otitis externa after swimming in recreational fresh water lakes containing Pseudomonas aeruginosa. BMJ. 1995;311:1407–10. 6. Clark W, Brook I, Bianki D, Thompson D. Microbiology of otitis externa. Otolaryngol Head Neck Surg. 1997;116 (1), 23-5. 7. Javier García Callejo, F. Considerations on acute otitis externa for its optimized treatment. Acta Otorrinolaringol Esp. 2009;60 (4), 227-233. 8. Garry, JP. Otitis Externa. http://emedicine.medscape.com/article/84923-overview. (accessed 13th Jan 2011). 9. Holten K, Gick J. Management of the patient with otitis externa. J Fam Pract. 2001;50(4)353-360. 10. Osguthorpe J, Nielsen D. Otitis externa: review and clinical update. Am Fam Physician. 2006;74(9):1510-6. 11. Russell J, Donnelly M, McShane D, Alun-Jones T, Walsh M. What causes acute otitis externa? J Laryngol Otol. 1993;107(10):898-901. 12. Kim J, Cho J. Change of external auditory canal pH in acute otitis externa. Ann Otol Rhinol Laryngol. 2009;118(11):769-72. 14. Schelkun P. Swimmer's ear: getting patients back in the water. Physician Sportsmed. 1991;19:85–88,90. 15. Sander R. Otitis externa: a practical guide to treatment and prevention. Am Fam Physician. 2001;63(5):927-937. 16. National Health Service (NHS). Otitis externa: treatment. http://www.nhs.uk/Conditions/Otitis-externa/Pages/Treatment.aspx. (accessed 13th Jan 2011). 17. Joint Formulary Committee. British National Formulary (BNF). 60th edition. London: British Medical Association and Royal Pharmaceutical Society of Great Britain; 2011. 18. Abelardo E, Pope L, Rajkumar K, Greenwood R, Nunez D. A double-blind randomised clinical trial of the treatment of otitis externa using topical steroid alone versus topical steroid-antibiotic therapy. Eur Arch Otorhinolaryngol. 2009;266(1):41-5. 19. Kaushik V, Malik T, Saeed S. Interventions for acute otitis externa. Cochrane Database of Systematic Reviews. 2010;50(1),CD00474. 20. Rosenfeld R, Singer M, Wasserman J, Stinnett S. Systematic review of topical antimicrobial therapy for acute otitis externa. J Otolaryngol Head Neck Surg 2006;134 (4), S24-48. 21. Cheffins, T. Acute otitis externa, management by GPs in North Queensland. Aust Fam Physician. 2009;38(4),235-42. 22. UK diving. http://www.ukdiving.co.uk/equipment/articles/swim-ear.htm (accessed 27th Jan 2011). 23. Yorkshire Divers. http://www.yorkshire-divers.com/forums/content/ (accessed 27th Jan 2011). Figure 1: Garry, JP. (2010). Otitis Externa. Available online: http://emedicine.medscape.com/article/84923-overview. Last accessed 13th Jan 2011. Figure 2: Otitis Externa. Available online: http://en.wikipedia.org/wiki/Otitis_externa. Last accessed 17th Jan 2011. Figure 3: Ear Infection and Swimming. Available online: http://www.ygoy.com/index.php/ear-infection-and-swimming/. Last accessed 17th Jan 2011. Figure 4: Bowdler D, Faulconbridge R. (2010). Infections of the ear. ENT UK. Available: http://www.entuk.org/patient_info/ear/infections_html. Last accessed 27th Jan 2011. Figure 5: Sander R. Otitis Externa: A Practical Guide to Treatment and Prevention. Am Fam Physician. 2001 Mar 1;63(5):927-937. Figure 6: Rosenfeld R, Singer M, Wasserman J, Stinnett S. (2006). Systematic review of topical antimicrobial therapy for acute otitis externa. Otolaryngol Head Neck Surg. 134 (4), S24-48.